She has a point. Certainly at one point, Antarctica was part of Pangea, and there had to have been life on the continent at one point. It’s just that in the extreme cold, digging for dino bones is miserable and largely fruitless. The ground is frozen solid, meaning the digging goes slowly. The cold means you can’t be out digging for very long, meaning the digging goes even more slowly. Also, almost everyone on your team wants to go home, so the digging is, for all intents and purposes, not really happening. You finally managed to erect a tent over the dig site. On the plus side, this means you can introduce a certain amount of heat into the area. In the minus column, you’re working in extremely cramped conditions for paleontology. Usually, the bigger the space you can dig, the better your odds of finding something. Looking in the space where just one tent is set up is almost entirely certain to be a failure. Almost certain. And so you dig. Digging through frozen soil has all the charm and entertainment value you’d expect, which is to say none. The dirt quickly turns to mud, which refreezes almost immediately onto your clothing. Progress has been slow, not only because of the climate, but because of morale. The work is so frustrating, as the lead at this dig, you constantly have to send the work teams out so they can go and enjoy the spectacular, unblemished surroundings and get their heads back together. You stopped calling this “taking a few minutes to cool down” after week one for obvious reasons. The mornings are the best. It’ll be a few hours before you need to remind everyone not to dig so hard they risk damaging any of the fossils which might potentially be under your feet. Though to be honest, your hopes are simply not very high. After a picturesque walk from the base camp to the dig site, you and Kimberly pick up your tools and begin your work. The labor is Sisyphean, and you know the best way to get through it is to keep your head down and try not to notice how much every single piece of rock and debris hidden in this bitterly cold mud looks exactly the same with no variations whatsoever . . .
No, that bit looks quite entirely different. It nearly glows in comparison to its drab surroundings. Hematite possibly? Though normally you need to polish hematite to get that much of a shine, and besides if that indentation in the ground is an indication . . . it’s huge. “Kim!” No one has needed to shout in the confines of the tents for so long that your voice breaks with the effort. All eyes are on you, and not only Kimberly, but the entire team is suddenly around you. Everyone’s been doing the same thing as you have for so long that there can be no doubt as to why you called them over. There is a fury of very precise and careful work. You’re all trained at such digs, and it’s vitally important that you work as hard as possible to prevent damage to whatever it is you just found. After what seems like an impossibly short time, however, the surface of your find has been cleared out. You all stare at what you’ve uncovered, trying to find some way to explain how this could be what there can be no doubt that it is. “It can’t be,” Sanderson replies. No one bothers to correct him or point out that it obviously is and couldn’t be anything else. Sanderson didn’t seem to believe himself when he said it, but all of you were thinking it. It simply can’t possibly, through any means, under any circumstances, be. But quite clearly it is. No human civilization ever existed on Antarctica. The continent was always too inhospitable, and besides what little information you’ve gathered from the surrounding fossil remains is that whatever you’re finding dates to more than a few million years before the dawn of mankind. 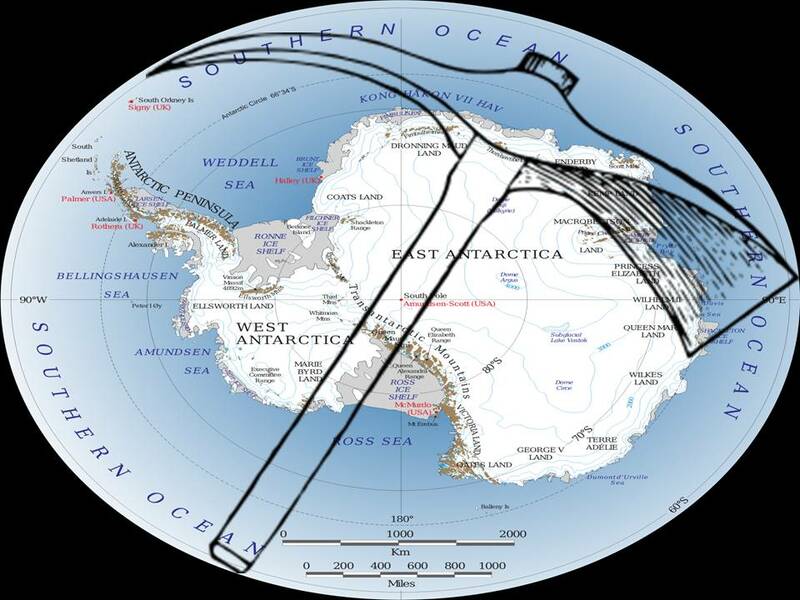 So clearly somebody at some point in history carried a huge piece of metal (unlikely) far into the vast frozen lands of Antarctica (yeah, right) and for some obscure reason (speculation at best) they underwent the Herculean task of burying the thing in the frozen soil (inconceivable) without leaving any trace of having done so (dubious at best). That sound is a rumble. You suddenly realize that you’re not so much hearing it as feeling it. You’re feeling it coming up through the ground below you. You stare down at your feet mouth agape, once again telling yourself that what you’re experiencing really shouldn’t be possible. This must be some sort of earthquake. Sure it feels like machinery activating beneath your feet, but certainly something so long buried couldn’t possibly function even if it were . . . Things become considerably more academic very quickly. The rumbling ends with a sudden click that you tell yourself could not possibly be the final stages of an automatic door unlocking. As you start to fall — you, Kim, and about half a ton of earth which apparently were standing on top of this hatch which now opens beneath you — you reassess your position. Whether it can be or not doesn’t matter. It is, and you’ve got to deal with it. Assuming you survive this fall, of course. You awaken. Simultaneously, you realize that awakening indicates you must have lost consciousness, at least for a moment. Slowly, you sit up, taking inventory of your body parts. Your head feels a bit tender. Obviously, you struck it on the way down. In other words, you were probably limp when you hit the ground, which is why, aside from some wicked bruises on your left side, you appear to be uninjured. There is no answer, which makes her safety your first priority. You struggle to your feet, pleased that you experience no dizzy spells. A concussion would make this even harder. Again, she does not answer. You scan the soil-strewn floor of … wherever this is, until you see her. You rush for her prone form, and you breathe a sigh of relief when she moans and turns over. You look up to judge the distance, and your mind freezes. What had struck you as light coming down from the opening at the top of the hole is, in fact light coming from what you can only call the ceiling. The light is a square pattern surrounding the hatch which you fell through. The hatch which is now sealed shut. You can hear, sort of, your crew on the other side of the hatch pounding to get in. You shout up to them, but it’s obvious that the sound is not getting through to them. Nothing is really getting through to them. Which means you’re trapped here. “What do we do now?” asks Kim. Rely on your team to find a way to open the hatch. Your priority is to treat this location as an archaeological dig. You're underground in Antarctica. Your priority is to find some source of heat and not freeze to death. You're trapped in here. Your priority is to find some way up to that hatch and try to reopen it. You've got an injured friend. Your priority is to administer medical attention to her. Priorities schmiorities. Start examining your surroundings and push every button you can. With Choose Your Own Geekery, you don’t just get to make a choice, you get to offer a choice for others. You have from now until October 13 to make a suggestion for what our intrepid Paleontologist should be doing. I’ll be filling the TBDs in with an actual suggestion on the 14th. You can make your suggestions here or on our Facebook Page. You may vote now, or wait until all options are in. Please do not vote for TBD, but wait until they are filled in. All votes must be in by October 21. The new chapter will be up by October 30th.